Kakula’s new, southern box cut. A third decline tunnel will be driven from the bottom of the box cut to provide access and ventilation to the southern side of the underground, high-grade Kakula Deposit. The Kamoa-Kakula Copper Project — a joint venture between Ivanhoe Mines (39.6%), Zijin Mining Group (39.6%), Crystal River Global Limited (0.8%) and the Government of the Democratic Republic of Congo (20%) — has been independently ranked as the world's largest, undeveloped, high-grade copper discovery by international mining consultant Wood Mackenzie. It is a very large, near-surface, flat-lying, stratiform copper deposit with adjacent prospective exploration areas within the Central African Copperbelt, approximately 25 kilometres west of the town of Kolwezi and about 270 kilometres west of the provincial capital of Lubumbashi. In February 2019, Ivanhoe Mines announced the positive findings of an independent pre-feasibility study (PFS) for the development of the Kakula copper mine and an updated, expanded preliminary economic assessment (PEA) for the overall development plan of the Kamoa and Kakula copper discoveries at the Kamoa-Kakula Project on the Central African Copperbelt, in the Democratic Republic of Congo (DRC). The PEA and PFS do not include any discoveries on Ivanhoe’s 100%-owned Western Foreland exploration licences that are adjacent to the Kamoa-Kakula Project. The February 2019 PFS and updated PEA built on the outstanding results of the previous PEA announced in November 2017. The PFS has advanced the detailed design and engineering in that earlier study and has confirmed the viability of the project. As well, the re-scoped and expanded PEA shows the potential to develop the project to a larger scale and with a larger production capacity. Kamoa-Kakula mining licence, showing the Kamoa, Kamoa North, Kakula and Kakula West Mineral Resource areas, and a portion of Ivanhoe’s 100% owned Western Foreland area. The Kakula 2019 PFS and Kamoa-Kakula 2019 PEA were independently prepared by Amec Foster Wheeler E&C Services Inc. (a division of Wood PLC) of Reno, USA; DRA Global of Johannesburg, South Africa; KGHM Cuprum R&D Centre Ltd. of Wroclaw, Poland; OreWin Pty Ltd. of Adelaide, Australia; Stantec Consulting International LLC of Arizona, USA, and SRK Consulting Inc. of Johannesburg, South Africa. All figures in the PFS and PEA are on a 100%-project basis unless otherwise stated. 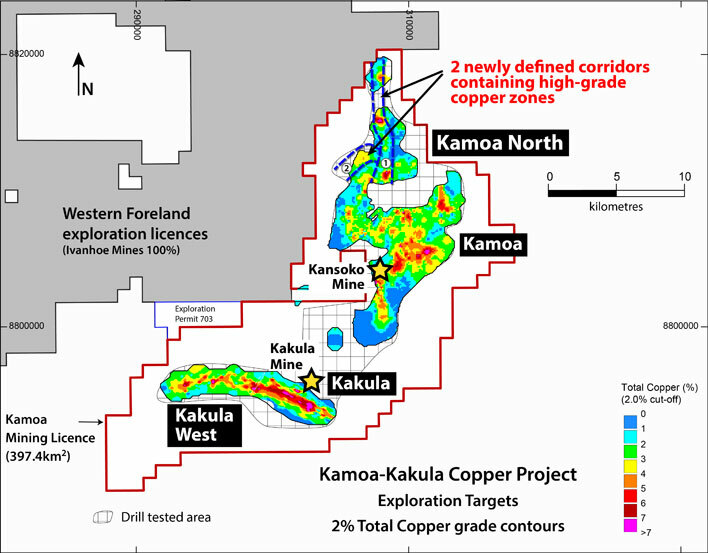 The Kakula 2019 PFS analyzes the development of an initial 6 Mtpa Kakula Mine at the Kakula Deposit in the southerly portion of the Kamoa-Kakula Project’s discovery area. For this option, the PFS envisages an average annual production rate of 291,000 tonnes of copper at a mine-site cash cost of US $0.46 per pound (lb) copper and total cash cost of US $1.11/lb copper for the first 10 years of operations, and copper annual production of up to 360,000 tonnes by year four. An initial capital cost of US $1.1 billion for this option would result in an after- tax net present value at an 8% discount rate (NPV8%) of US $5.4 billion . The internal rate of return of 46.9% and project payback period of 2.6 years confirm the compelling economics for the Kamoa-Kakula Project’s stage one of production. The Kamoa-Kakula 2019 PEA presents the alternative development option of a three-phase, sequential operation on Kamoa-Kakula’s high-grade copper deposits. For the three-phase sequential operation, the PEA envisages US $1.1 billion in initial capital costs. Future expansion at the Kansoko Mine, Kakula West Mine and subsequent extensions could be funded by cash flows from the Kakula Mine, resulting in an after-tax net present value at an 8% discount rate ( NPV8% ) of US $10.0 billion and an internal rate of return of 41%. The 18 Mtpa scenario delivers average annual production of 382,000 tonnes of copper at a total cash cost of US $0.93/lb copper during the first 10 years of operations and production of 740,000 tonnes by year 12. At this future production rate, Kamoa-Kakula would rank as the world’s second largest copper mine. Figure 1 describes the expanded development scenario for the Kamoa-Kakula 2019 PEA and Figure 2 shows an overview of deposits included within the Kakula 2019 PFS (6 Mtpa case), Kamoa 2019 PFS (6 Mtpa) and Kamoa-Kakula 2019 PEA (18 Mtpa). Additional exploration success at Kakula West, Kamoa North or regional exploration targets may have a significant, positive influence on the size, value and timing of the overall development plan. Figure 2. Overview of deposits included within the Kakula 2019 PFS (6 Mtpa - outlined in red box), Kamoa 2019 PFS (6 Mtpa - outlined in blue box) and Kamoa-Kakula 2019 PEA (outlined in green box). Initial capital cost, including contingency, is estimated at US $1.1 billion. Average total cash cost of US $1.11/lb copper during the first 10 years, inclusive of royalties. After-tax NPV , at an 8% discount rate, of US $5.4 billion. After-tax internal rate of return ( IRR ) of 46.9%, and a payback period of 2.6 years. For additional details of Kakula 2019 PFS and Kamoa-Kakula 2019, please refer to Ivanhoe Mines February 6, 2019 news release. The 2019 Kamoa and Kakula Indicated and Inferred Mineral Resource estimate was prepared by George Gilchrist, Ivanhoe Mines’ Mineral Resources Manager, under the direction of Dr. Harry Parker and Gordon Seibel, both RM SME , of Amec Foster Wheeler, of Reno, USA , and is reported in accordance with the 2014 CIM Definition Standards for Mineral Resources and Mineral Reserves. Dr. Parker and Mr. Seibel are the Qualified Persons for the estimate. The Kakula 2019 PFS Mineral Reserve has been estimated by Qualified Person Jon Treen, Senior Vice President, Stantec Consulting International LLC , using the 2014 CIM Definition Standards for Mineral Resources and Mineral Reserves to conform to the Canadian National Instrument 43-101 Standards of Disclosure for Mineral Projects. The total Mineral Reserve for the Kakula Project is shown in Table 9. The Mineral Reserve is based on the April 2018 Mineral Resource. The Mineral Reserve is entirely a Probable Mineral Reserve that was converted from Indicated Mineral Resources. The effective date of the Mineral Reserve statement is February 1, 2019.